The River Oaks brings luxury condominium homes to a prime River Oaks location. 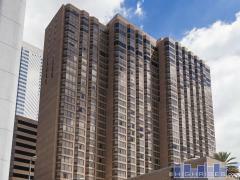 This remodeled high-rise offers unobstructed views and private landscaped gardens. State of the art amenities at The River oaks include valet, concierge, guest suites, pools, fitness center, private dining room and more. Have any comments or questions about The River Oaks? Ask your question and/or share your thoughts about this Building.